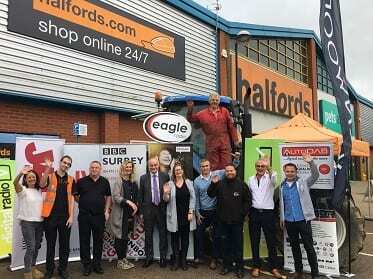 The launch of a major pilot scheme, Go Digital Car, was announced at an event in Redhill on Friday (13 October), attended by Surrey’s local radio broadcasters, garages and auto specialists, who are collaborating on the project to make it easier for drivers to get digital radio in any vehicle. To mark the launch of the pilot which is taking place exclusively in Surrey for three months from 16 October - and to demonstrate that any vehicle can be upgraded to a digital radio – a digital radio unit was fitted into a tractor owned by local farmer, John Nicholas, at Halfords in Redhill at the launch event. Halfords’ colleague, James Gerrish, who has been trained to fit all digital radios, fitted a replacement Sony in car digital radio into Mr. Nicholas’ 6 year old New Holland tractor in 30 mins, meaning he can now listen to over 50 radio stations, including his favourite local Surrey stations. There are over 20 garages and retailers across Surrey participating in the Go Digital Car pilot, including Halfords, Halfords Autocentres, KwikFit and independent garages and a great range of digital radios and digital radio adapters are now available from leading manufacturers including Nextbase, Sony, Pure, JVC, Kenwood and AutoDAB. Prices start from as little as £99 plus fitting and drivers can ask for a digital radio upgrade when they book their car, van - or any vehicle - in for a service or MOT (see Notes to Editors for full details). The scheme is being supported by Surrey’s popular local broadcasters, including BBC Radio Surrey, Heart Surrey, Eagle Radio, Jack Surrey and Premier Praise, who are letting listeners know where and how they can get digital radio in their car in Surrey in special promotions and features, as well as running competitions for listeners to win a free digital radio upgrade. Surrey, where over 70% of households have a DAB digital radio and over 53% of all radio listening is to a digital platform, is one of the most digital areas of the UK. Today, 90% of new cars in Surrey come with digital radio as standard but still the majority of existing cars in Surrey cannot receive the 50-plus digital radio stations available. The Go Digital Car pilot aims to help drivers understand that any vehicle can be upgraded to digital radio and that it is easy to get one. Government has stated that they will review whether to set a timetable for a digital radio switchover when 50% of radio listening is digital. It is currently at 48.7% and the 50% threshold is expected to be met by the end of the year. Matt Hancock MP, Minister of State for Digital, said: "It's brilliant for drivers that nearly 90% of new cars have a digital radio, but millions of existing cars still don't have access to the full range of stations that are available. The Surrey Go Digital Car pilot will make a real difference and help drivers upgrade their old analogue radio to digital." Catherine Marsden, Marketing Manager, Premier, said: “We know that lots of our listeners are missing Premier Praise, Premier Gospel and Premier Christian radio in their cars, so we’re thrilled to be supporting this great initiative to make it easier for them to upgrade their car to digital radio." Drivers in Surrey can find out where to find trained and approved installers who can provide a digital radio upgrade for their vehicle by visitingwww.getdigitalradio.com/surrey. Retailers and garages participating in the Go Digital Car pilot are Halfords and Halfords Autocentres throughout Surrey; Kwik Fit Plus in Guildford; Bannings Car Audio & Security in Guildford; Cartronics in West Byfleet; Carters Car Care in Dorking; and Woodside Park Garage in Godalming. Manufacturers with digital radios and/or adapters available participating in the Go Digital Car pilot are Nextbase, Pure, Auto DAB, JVC, Kenwood, Radioplayer Car, Sony, POP and Tiny.